Omnibox is a prominent feature of Google’s Chrome Browser. 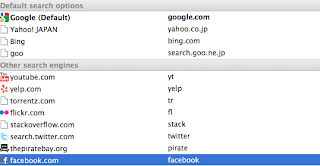 Omnibox is Chrome’s combined search and address bar feature, which allows you to use the address bar as a search bar. Type a search term in the address box (Omnibox) and press enter to see results from your default search engine. But it happens that you want to use Youtube search or Wikipedia search instead. Click to the Manage button next to the Default Search label. Double click on an item shows up a dialog where you can set up the keyword. If you type this keyword and your search query to the Omnibox, Chrome will search with that engine. I changed youtube's keyword to yt so if I type yt Humcrush to the Omnibox it'll show me Humcruch youtube videos.